A new service promises to revolutionize the way you use Gmail. We put it to the test. Google may have made waves with its recent Gmail redesign, but these days, it's a fresh interface by some former Googlers that's generating all the buzz. Fluent is a startup launched by three guys who left Google to revolutionize email on their own terms. They came up with a Web-based email client that aims to transform Gmail from a stagnant inbox into a "work-oriented stream." Their basic goal is to make Gmail more chatty and conversational -- more like texting and less like, well, email. 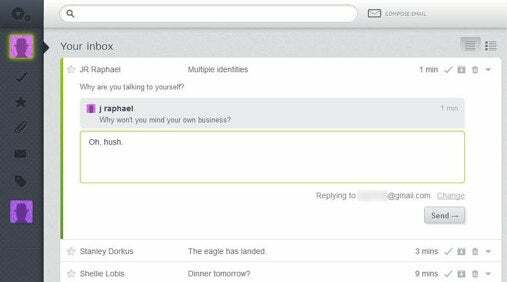 Fluent is a Web-based email client that aims to transform Gmail from a stagnant inbox into a "work-oriented stream." Plenty of people are intrigued by the concept: Fluent's founders say they've gotten tens of thousands of signups since opening in private beta earlier this year. At this point, there's a minimum two-month wait just to get in. Not to worry, though: We can take you inside Fluent right now. I've spent some time testing the service to see what it's all about. Your personal tour starts here. The guys behind Fluent all worked on Google's short-lived Wave collaboration tool -- Cameron Adams was the lead designer, Dhanji Prasanna helped build Wave's real-time search system and Jochen Bekmann served as the project's tech lead -- and that influence clearly shines through in their new creation. The second you get into Fluent, you see Gmail in a whole new way. Fluent shows your messages as a stream of conversations, making the experience more like browsing through Facebook than trudging through email. While Gmail requires you to click on a message to open it before replying, Fluent's Reply box is right on the Inbox screen, akin to a comment thread on a Facebook post. You never have to open a message to view responses or add your own response. Gone are the increasingly superfluous functions Google has tacked onto Gmail, such as "Invite a friend," Google+ functions, etc. -- not to mention the ads. In their place, Fluent provides a minimalistic gray navigation bar on the left of the screen and a simple white toolbar on top. The navigation bar gives you access to a handful of settings as well as your drafts, starred messages, attachments, labels and "all mail" view. It also has a button that lets you browse attachments -- Fluent compiles all attached files from emails and centralizes them in a single, easily filtered and searchable slideshow -- and one that allows you to view your to-do list (more on that in a moment). Fluent shows your messages as a stream of conversations, making the experience more like browsing through Facebook than trudging through email. Fluent's top-of-screen toolbar is taken up largely by an instant search function, which is one of the service's standout features. Fluent starts searching as soon as you type a single letter into the box; results from your email appear almost instantly and then morph as you continue to construct your search term, much like what Google does with its "Instant" search functionality. The speed and accuracy of the mail search is stupendous; it makes you wonder why Google doesn't have something similar in place for its own Gmail interface.